Partial words are sequences of characters from an alphabet in which some positions may be marked with a “hole” symbol, ⋄. We can create a ⋄-substitution mapping this symbol to a subset of the alphabet, so that applying such a substitution to a partial word results in a set of full words (ones without holes). This setup allows us to compress regular languages into smaller partial languages. Deterministic finite automata for such partial languages, referred to as ⋄-DFAs, employ a limited non-determinism that can allow them to have lower state complexity than the minimal DFAs for the corresponding full languages. 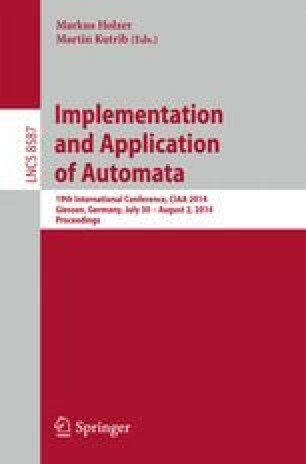 Our paper focuses on algorithms for the construction of minimal partial languages, associated with some ⋄-substitution, as well as approximation algorithms for the construction of minimal ⋄-DFAs. This material is based upon work supported by the National Science Foundation under Grant No. DMS–1060775.